Being in need of a soldering station but having too little cash to waste, I decided to create my own. This decision was also helped by my scepticism towards the quality of modern knock-offs that comprise much of the market today. Don't get me wrong, some of the newer chinese-made soldering tools sold today are well worth the money, but those in the lower-end segment don't tempt me too much after having done some research on them and seeing some reviews. comparator, an optocoupler, a triac and some passives. Most people I know that built the same driver also added a display to it in order to show the temperature. Although primitive, this driver worked well for over 2 years until I decided to scrap it, mainly due to the fact that I couldn't find new tips for the iron. The sellers didn't resupply them since most people threw the units away after the coating of the tips started to wear off (thing which happened quickly). Also each time the tip was changed, the temperature scale drifted because the thermocouple was moved from its old spot. This meant calibration had to be performed again and again, eventually becoming a burden. 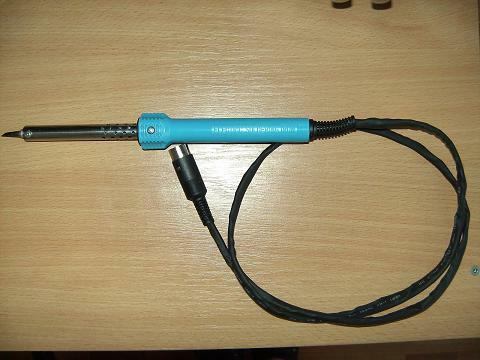 One could improve on the old design by adding a new soldering iron to it (for example one made for Gordak stations). Any improvements would be modest though because analog circuits aren't too flexible compared to digital ones. The driver should be digital, based on a well known microcontroller. This offers many advantages over the analog counterparts (for example we can use the software to compensate for accuracy problems). It should be fairly accurate. Considering the small budget, the temperature information shown on the screen will most likely not be spot on with the reality but that's not a problem in my book. After all, the driver is just half of the equation, the iron being the other. The driver should accept a standard, 24 volt soldering iron with an integrated K-type thermocouple to take readings from (since most soldering irons are built with thermocouples these days, the exception being some of the professional units like the Hakko ones). I'll keep you posted with any progress on the design.